Huawei's Matebook X Pro focuses on the areas you'll care about, making this thin-and-light one to consider for your next laptop purchase. Huawei’s Matebook X Pro may remind you of how another Chinese vendor, OnePlus, captured a chunk of the smartphone market with flagship specs at an affordable price. 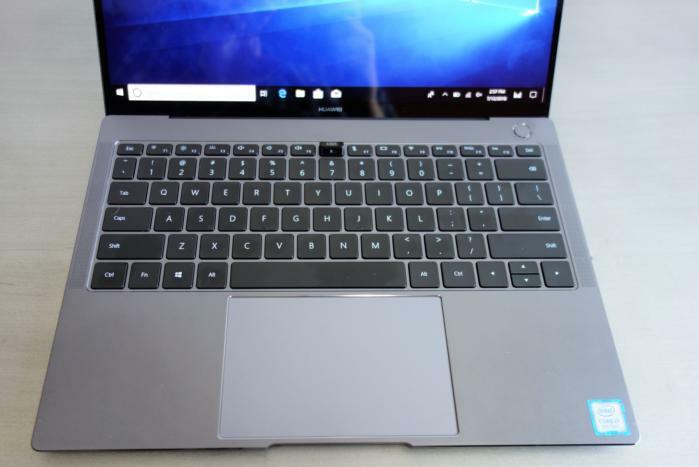 Besides the oddball pop-up webcam and a short supply of the high-end Core i7 model, the 14-inch Matebook X Pro thin-and-light offers several compelling reasons to buy it: a great display, a good keyboard, terrific audio, and even an included USB-C dock. 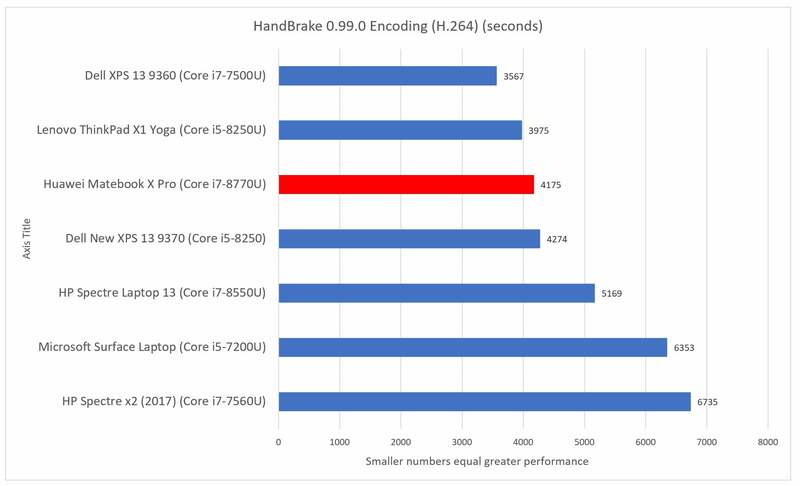 It’s hard to believe that Huawei even included a discrete GeForce MX150 GPU in the faster, Core i7-powered version. But Huawei also cut a corner or two. Power limits restrict its performance, and both its Thunderbolt port and discrete GPU are cut-down versions. Battery life is middling. It’s also hard to find: A Core i5 version can be found on Amazon for the superb price of $1,199. 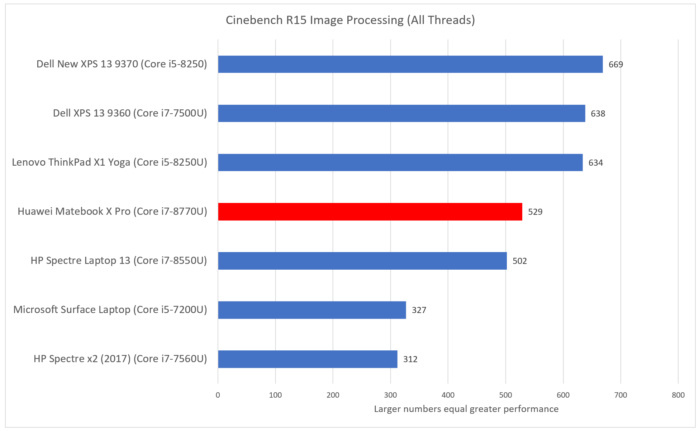 You’ll need to track down the Core i7 version that we tested, which we found at B&H Photo for $1,499, but at Amazon for close to $1,900. A large trackpad dominates the Huawei Matebook X Pro’s keyboard. The Matebook X Pro is sturdily made. I never felt the laptop flex or give while carrying it around or typing. We were offered a Space Gray unit for review, though a Mystic Silver option is also available. 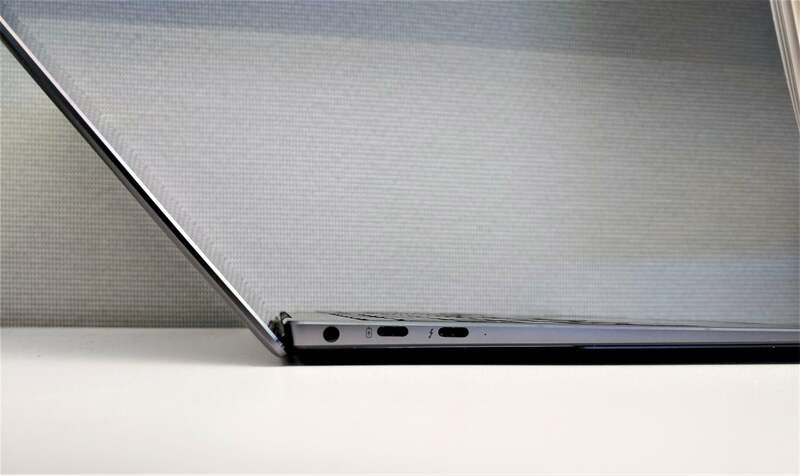 Huawei gave the surfaces of the laptop a sandblasted matte look, though the rounded, polished edges gleam. The aluminum construction measures 14.6mm at its thickest, barely accommodating the USB-A ports near its rear hinge. Between the nearly bezel-less (just 4.4mm!) display and the oversize trackpad, there’s not much wasted space. The Huawei Matebook X Pro is just thin enough to allow for a USB-A port on one side. Two models are available, both of which use Intel’s 8th-generation parts: the Core i5/8GB memory/256GB SSD version, which lacks a discrete GPU; and the Core i7 version, with 16GB of memory/512GB SSD and the Nvidia MX150. It’s clear early buyers snapped up the excellent value the high-end Matebook X Pro offered, as they were difficult to find online. 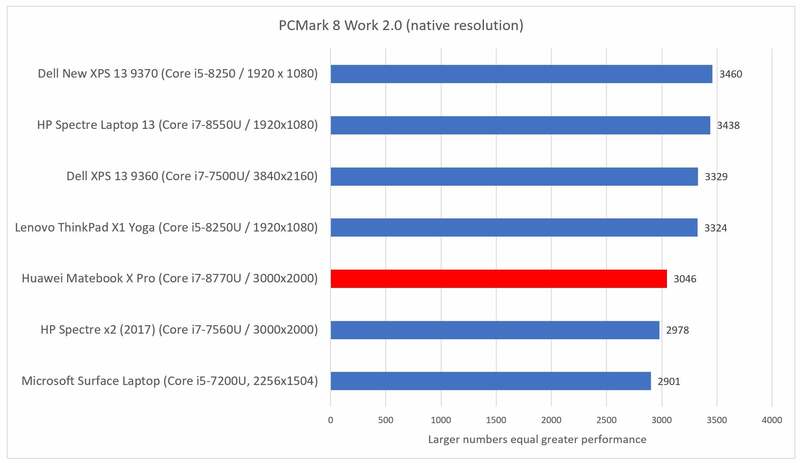 That may encourage buyers to turn to the more prosaic Core i5 model unless they can hunt down the Matebook X Pro Core i7 model. Though the Huawei Matebook X Pro weighs in on the heavy side—slightly less than the older MacBook Pro, but heavier than the Dell XPS 13—the tapered edge gives it a more svelte feel. The Matebook X Pro isn’t a convertible, so this represents its full recline. Two USB-C ports are on the right side, along with a headphone jack. What it all boils down to is this: Subjectively speaking, the Matebook X Pro’s display is as good as the Microsoft Surface Book 2's, usually my go-to notebook for content creation. It’s that good. The Huawei Matebook X Pro’s audio booms from speakers mounted underneath the keyboard, though the overall quality was tinny, as expected. To fix that, you’ll need to enable the built-in Dolby Atmos app, which utterly transforms the sound quality to among the very best I’ve heard from a laptop. The power is enough to vibrate the chassis slightly. Though the Matebook X Pro’s backlit keys are a bit stiffer and shallower than I’d prefer, the typing experience was pleasant. The broad keys provide a spacious landing pad for your fingers, and the resistance helps cushion your fingers. As I normally do, I wrote this review using the Matebook X Pro’s keyboard, and I’d happily do so again. You’ll also like the Huawei Matebook X Pro’s excellent fingerprint reader, which is integrated with the power button. 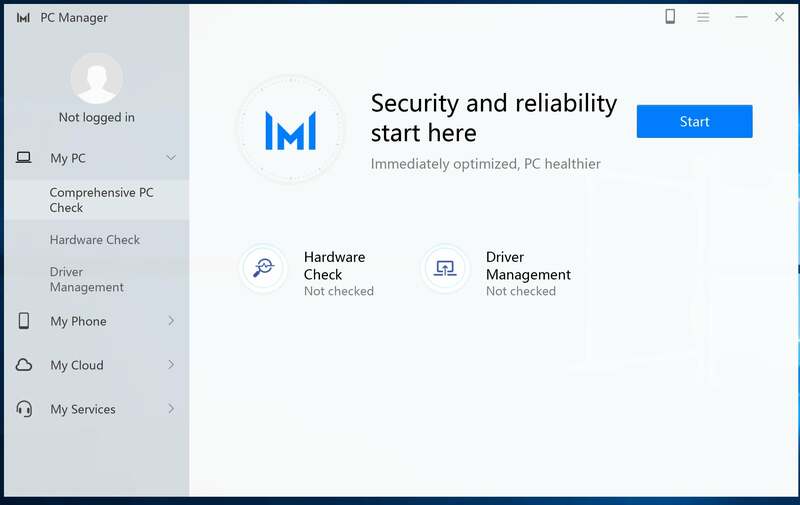 Fingerprint readers have the advantage of usually being fast and accurate, and the Matebook X Pro’s Windows Hello-compatible reader follows suit. About the only drawback is the lack of a visual indicator reminding you to log in with your finger, though muscle memory should kick in quickly. The fingerprint reader hides behind the circular power button. Just press to turn it on, then tap again to log in. 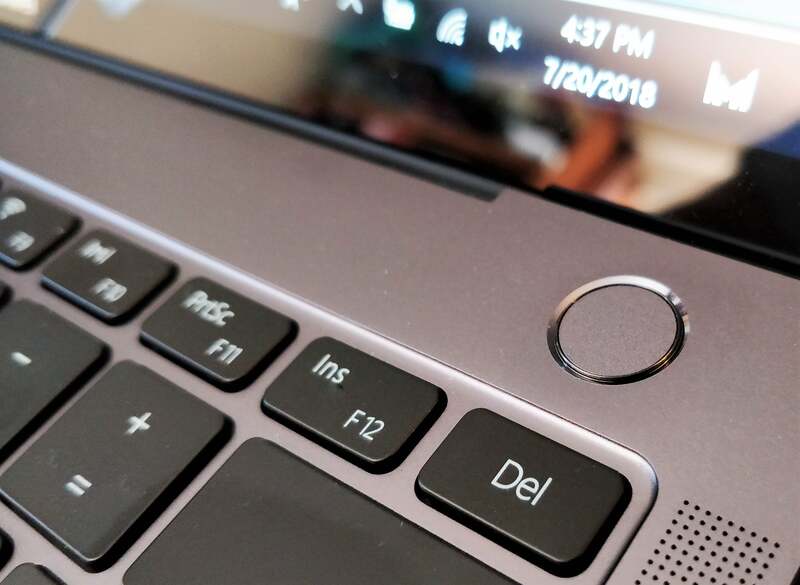 The Matebook X Pro’s keyboard has its quirks, though. For one thing, the laptop appears to vent heat through the small speaker grilles on each side of the keyboard, as well as through the chassis itself. That can warm up the palm rest a bit. The backlight controls toggle through “high,” “low,” and “off” settings. 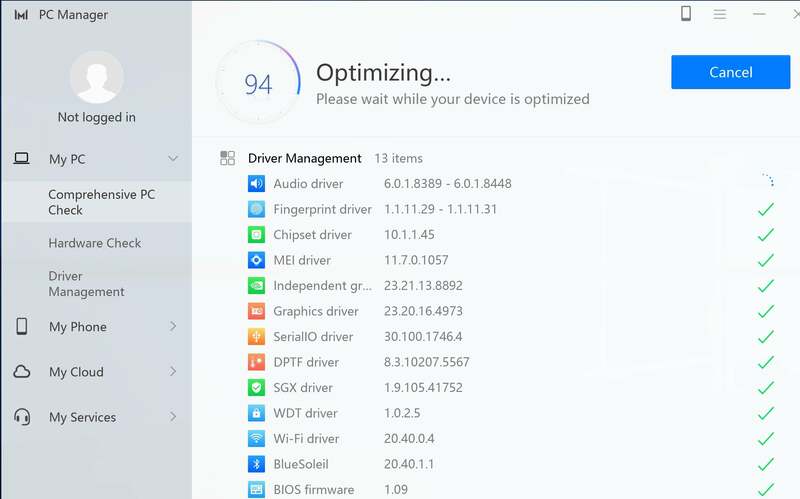 There’s also a dedicated key for the Huawei PC Manager software, which generally replaces the Windows Settings menu. Here’s the Matebook X Pro’s webcam: tap in to pop it up, press it to hide it once again. When in use, a small white LED lights to the left of the lens. 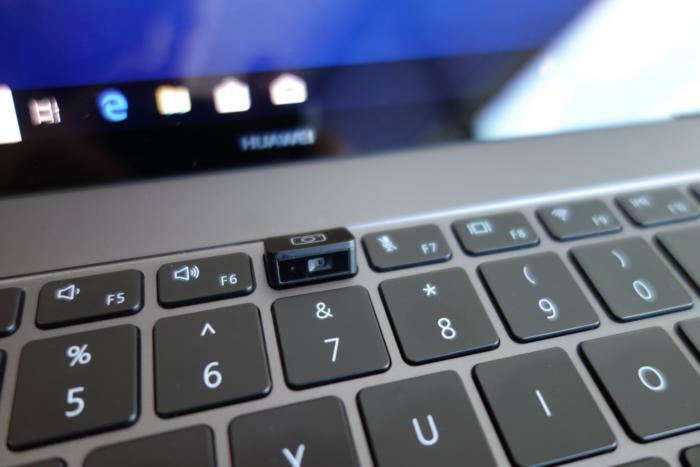 Clearly the oddest thing about the Huawei Matebook X Pro, however, is the small, popup, front-facing camera that emerges from the top row of function keys. (There is no rear camera.) It’s only 1MP in resolution, but its real purpose is to protect your privacy. The spring-loaded camera will pop out of its hidey-hole only with a physical touch. It’s functional even if you don't pop it out—launching the Camera app and picture with the camera hidden results in a picture of a black screen. Note, too, that the mic will record audio even with the camera hidden, and you might never notice because the microphone's indicator light is hidden from view along with the camera. Typing while using the Matebook X Pro’s webcam exposes you to all sorts of unflattering angles. And those giant hands! When deployed, the camera's limitations become clear. Its angle is not adjustable. I'm a tall person (6'2"), and it cut off half of my face if I sat normally. If I typed, my fingers’ proximity to the camera exaggerated their size to B-movie proportions. I enlisted a shorter person (5'2") to try the camera, and the camera framed them perfectly well. You may also find that the upward-facing perspective isn't flattering for most people. Vanity, thy name isn’t the Matebook X Pro. The MateBook X Pro's connectivity is surprisingly good. On its left side sits a pair of USB-C ports, one with the high-speed Thunderbolt interface (USB 3.1 Gen 2), the other with just a conventional USB 3.1 Gen 1. On the right side, the Matebook X Pro squeezes in a single USB-A port, neatly compromising between old and new peripherals. And it gets better. The MateDock 2 is a nice touch: a convenient USB-C hub that supports many legacy connections. 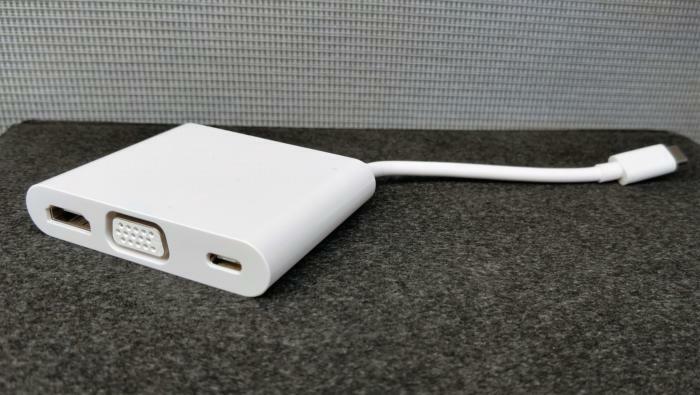 As Huawei has done with some of its other products—notably the 2016 Matebook tablet—it’s also included a dedicated USB hub, the MateDock 2, to accomodate legacy hardware. 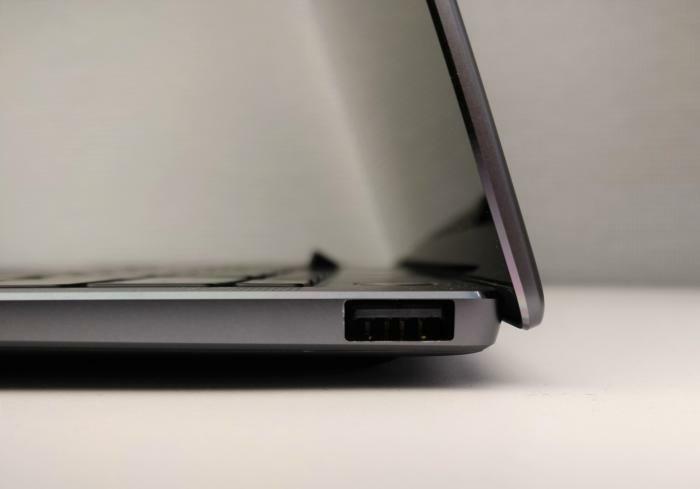 The hub includes a USB-A port, an HDMI interface, and even VGA—along with a USB-C passthrough that allows you to charge the notebook or connect to a display. Though the Huawei Matebook X Pro isn’t cheap, the addition of a hub is a thoughtful gesture that newcomers to USB-C will appreciate. The Matebook X Pro’s full name is officially the Huawei Matebook X Pro Signature Edition, co-opting the “signature” title from Microsoft. Microsoft sells “Signature Edition” versions of third-party notebooks through its online stores, purging them of all the unnecessary crapware that PC makers sometimes load them up with. Only Huawei’s omnibus PC Manager app appears on the Matebook X Pro. But there’s also a number of superfluous apps, including two versions of Candy Crush, and the Hidden City hidden pictures game. The PC Manager software is relatively straightforward. Unfortunately, there’s little to recommend enabling the PC Manager software, which performs three key functions: checking to see if the hardware components are working correctly and keeping drivers up to date; serving as a hub to connect to a Huawei phone; and serving as a front end to Huawei’s online support and accessory purchasing—the last of which, surprisingly, was in German. Huawei would like you to sign up for a Huawei ID to perform functions like wirelessly tethering your phone as a hotspot, though there’s nothing preventing you from separately turning on your phone as a hotspot, and then connecting via Wi-Fi or Bluetooth to it. The PC Manager performs an “optimization” check to make sure that your software and drivers are up to date. The only other Huawei utility is the Display Manager, which you can access by right-clicking the desktop. Essentially, Display Manager controls the size of text and icons as well as the color temperature; it’s here that you can initiate an “eye comfort mode” that reduces the blue light the display emits, which can impede your ability to sleep. 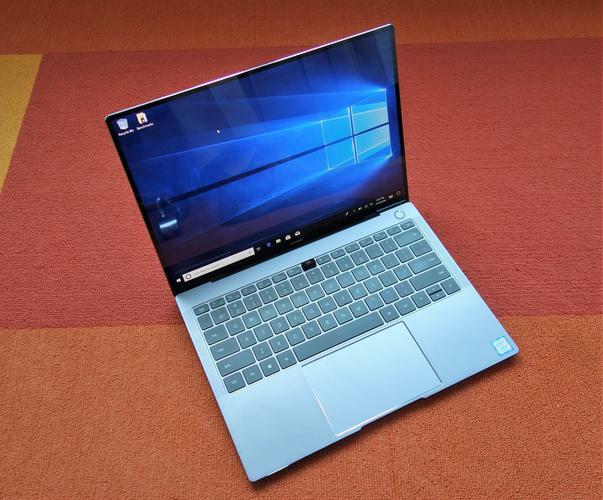 As a premium ultraportable, we compared the Huawei Matebook X Pro to several others in its class, among them two Dells (the XPS 13 and the New XPS 13) as well as the HP Spectre 13. Though the Matebook X Pro looks somewhat like the new 13-inch MacBook Pro, we haven't yet reviewed that model. 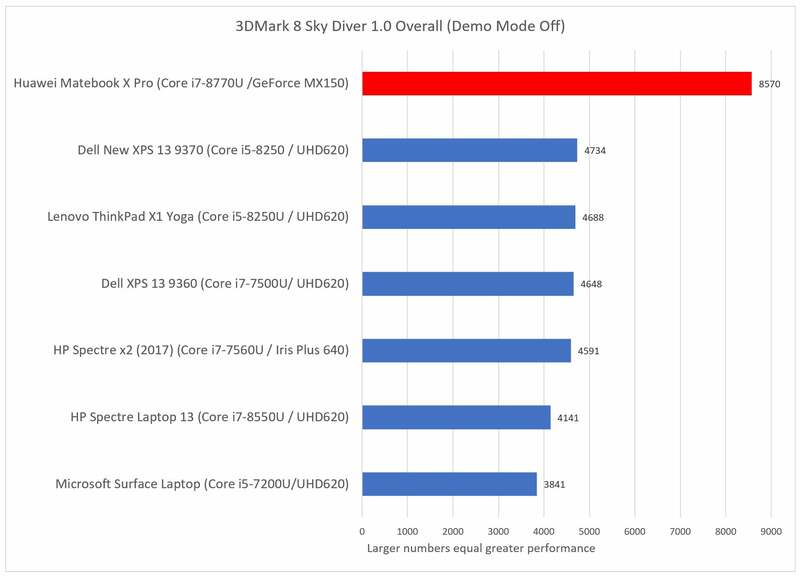 You might remember that we also compared the specs to the Microsoft Surface Book. The Book is a bit chunkier than the Matebook X Pro, as it turns out, so we excluded it from our direct comparisons. But the Matebook X Pro also looks better on paper than in the real world, due to three technical limitations that you should know about. First, we discovered that the Matebook X Pro is subject to power limit throttling. This means the laptop's CPU will refrain from using its burst (overclocked) mode when all of its cores are being stressed, reducing its performance potential. Second, the GeForce MX150 GPU used within it is a special down-clocked model, which saves some power at the cost of some performance. Finally—and this is a special case that won’t affect many customers—its Thunderbolt port uses only half the lanes that it could, which will limit its utility if used with an external GPU or monitor. Given the Matebook’s price and specs, we'd expect it to fare well in our standard home and office benchmarks, as evidenced by the PCMark suite of tests. And that’s true: The combination of the processor, 8GB of memory, and a speedy SSD means that it eats up typical office tasks such as word processing. Still, driving a high-resolution display limited its performance somewhat. The Huawei Matebook X Pro may not top the PCMark Work charts, but it always felt fast and responsive. For home and creative use, we used the corresponding tests within the PCMark suite as well. While the Home test and Creative test overlap in web browsing and light gaming, the Creative test adds some photo and video manipulation on top of it. 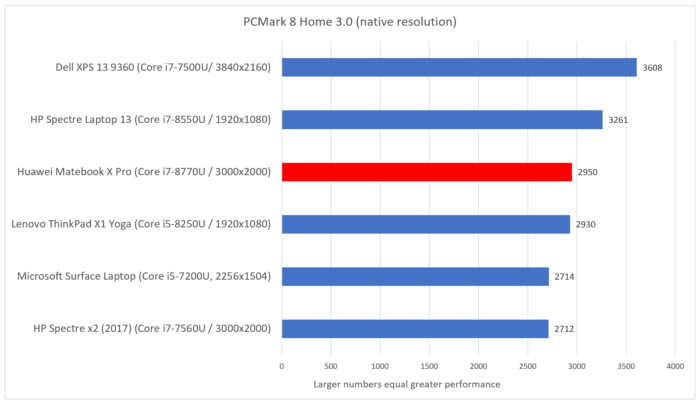 Again, the higher-resolution display and potential power throttling lower the Matebook X Pro’s score a bit. This is another case where most of the competition is tightly bunched together. Most of these laptops and tablets will perform just fine in most home tasks. Maxon’s Cinebench is the most universal score among all we use, measuring how well the notebook renders a complex image in real time. It’s a good way to evaluate “bursty” tasks such as photo manipulation, which tax the processor and GPU in similar ways. Here, the Matebook X Pro performs fairly well. Dell’s offerings continue at the top of the heap, with the Matebook X Pro trailing. Likewise, the HandBrake open-source benchmark is a prolonged stress test, measuring how the laptop will hold up under load. Here, we use the open-source tool to convert a full-length movie into a format that can be used by an Android tablet, such as for an airplane flight. 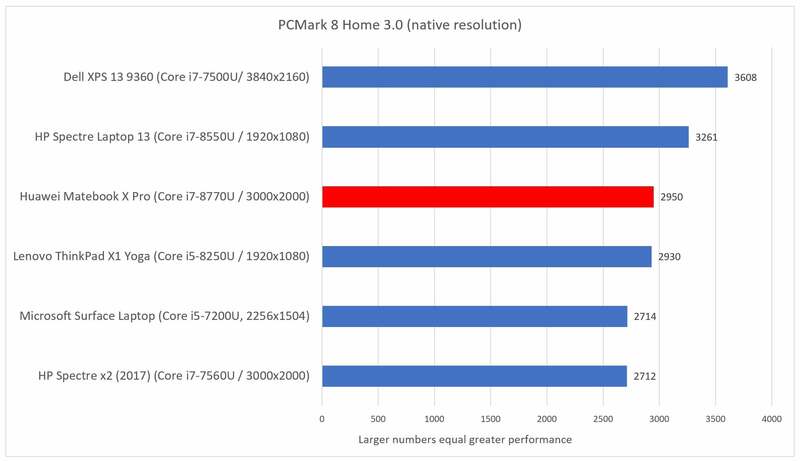 Here, the Huawei Matebook X Pro fares pretty well, probably evidence that it doesn’t run into any thermal throttling issues during the run of the test. Don’t think of the Huawei Matebook X Pro as a “gaming” laptop, per se. But the discrete Nvidia GPU offloads enough of the graphics tests to make it a worthwhile choice for some older games, and should work well for an real-time-strategy game, too. Just don’t throw any first-person shooters at it without dialing down the graphics settings. Note that you’ll hear some fan noise during gaming sessions, though the fan isn’t loud enough to be obtrusive. We use the 3DMark Sky Diver test here, a synthetic benchmark that still gives us a good idea of how it will perform. There’s just one catch: the MX150 within the Matebook X Pro is a downclocked, low-power version. The full-power GeForce MX150, for thicker notebooks, runs at about 1.5GHz. The slower, lower-power version within the Matebook X Pro runs at a mere 937MHz, as measured by the GPU-Z utility. The problem is that neither Huawei nor Nvidia makes this explicitly clear, so it’s only revealed after further investigation. 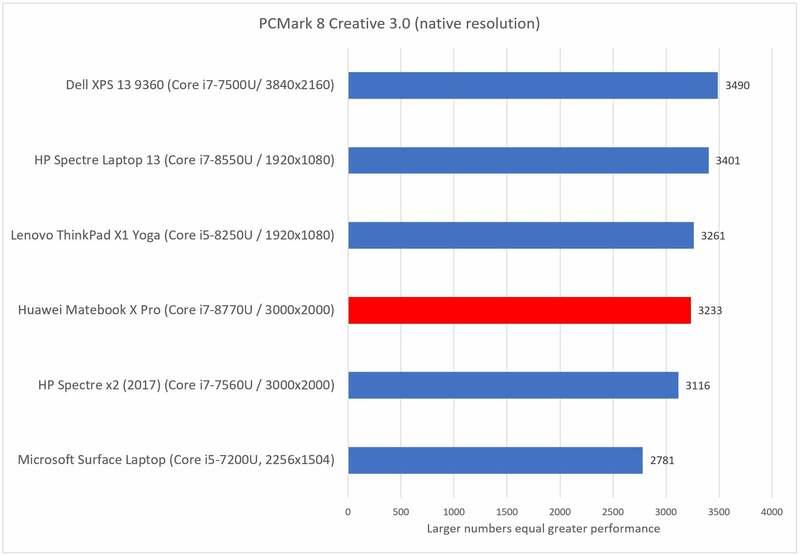 Graphics/gaming performance is clearly one of the primary reasons to buy the Matebook X Pro, as none of the competition can hold a candle to it. The Matebook X Pro includes the Intel Alpine Ridge LP Thunderbolt controller, allowing you to connect it with a cable to an external graphics dock or external monitor. But the Alpine Ridge controller supports just two lanes, rather than the expected four, for a total of 8 gigatransfers. Enthusiasts who care about such things should know that an eGPU won’t have as much bandwidth available as it would with other machines. 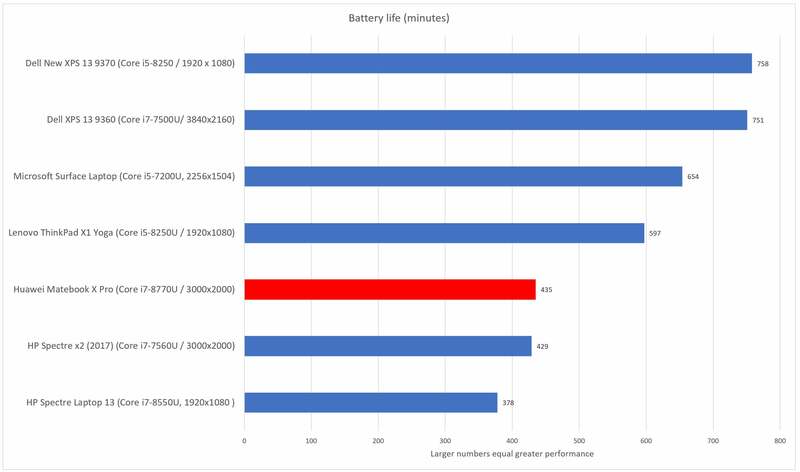 Finally, we turn to battery life, one of our key metrics. We charge the laptop's battery to full. We also dial down the screen brightness to 250 nits, as measured by a light meter, a level which allows the screen to be viewable in dim light. Then we loop a movie over and over until the battery expires. The Matebook X Pro’s scant seven hours of battery life is pedestrian, but it will hold its own over the course of a day. At just over 7 hours of battery life, the Huawei Matebook X Pro isn’t really that competitive. But you’re also buying a laptop that errs on the side of performance, not longevity. 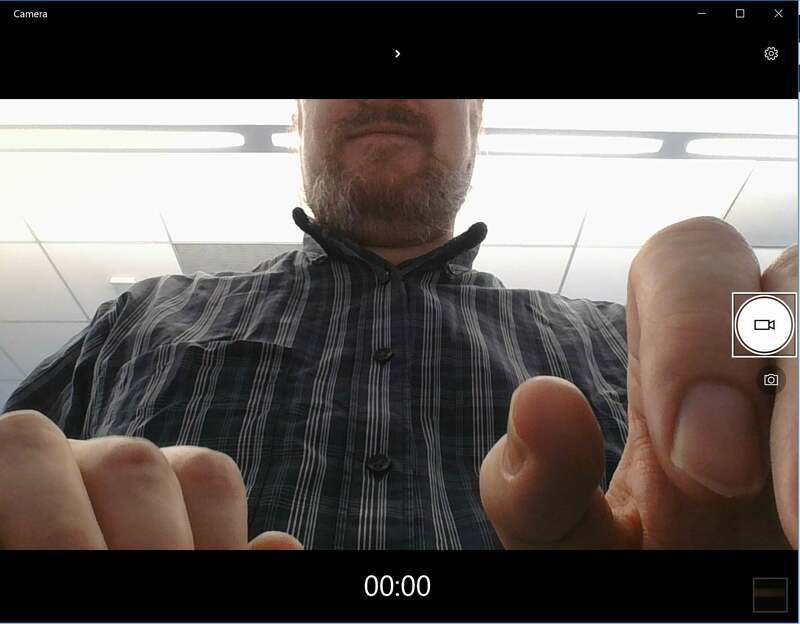 While it’s time for Huawei to abandon its experiment with keyboard-mounted webcams, there’s really nothing else to highlight as wrong with the Matebook X Pro. In fact, if you’re looking for a bargain gaming ultrabook, the Huawei Matebook X Pro fits the bill—though purists might not be happy with a slower external GPU and Thunderbolt port. In our view, Huawei cut a corner here and there, but focused its efforts on areas where consumers care the most.